Hypoallergenic is a complete dietetic feed for dogs formulated to reduce ingredient and nutrient intolerances. Hydrolysed protein with low molecular weight to ensure the food is hypoallergenic. Contains moderate phosphrous levels to help support healty kidney function. Incorporates a moderate calorie content to help maintain ideal body weight. Composition : derivatives of vegetable origin (pea starch), vegetable protein extracts (soya proteins hydrolysate), oils and fats, minerals, meat and animal derivatives (chicken liver hydrolysate), various sugars. Additives (per Kg) : nutritionnal additives : vitamin A : 5000UI, vitamin D3 :340 UI, E1 (iron) 25 mg, E2 (iodin) 2mg, E4 (copper) 6mg, E5 (manganese) 32 mg, E6 (zinc) 120mg - technological additive : triphosphate pentasodique 3g. Analyticals % : protein 6, fat content 3.5 , crude ash 1.6, crude fibres 2, moisture 74.5, essential fatty acids w3: 0.3 and w6: 1.7. 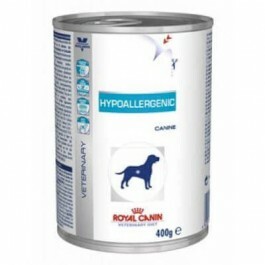 Royal Canin Hypoallergenic should be recommended by your veterinary surgeon. For detailed information on feeding amounts and how this food can help your pet, please consult your veterinary surgeon. Royal Canin Hypoallergenic Canine is a complete dietetic feed for dogs formulated to reduce ingredient and nutrient intolerances.